CONTENT WARNING for discussion of sexual assault, homophobia, predatory behavior, and bullying. SPOILERS for all of Yurikuma Arashi. Fantastical fiction is an ideal space for working through complex real-world issues using the frame of allegory, metaphor, and a little bit of magic. Yurikuma Arashi is one such series, a step detached from reality but with something to say about real-world problems: broadly about bigotry and ignorance, but also more specifically about homophobia and the societal stigmas queer women face. While the series’ constant and varied use of symbolism is sometimes flawed and problematic, its message also lands with considerable impact because it includes protagonists that belong to the marginalised group at the heart of its magical, metaphorical conflict. Namely, Yurikuma Arashi uses a fantasy setting, exaggeration, and abstract visuals to deliver a message about the prejudice that queer women face, and, for all its flaws, works doubly well because its main characters are themselves queer women. Yurikuma Arashi is a visually stunning and frequently bizarre coming-of-age story set in a world where humans are separated from sentient bears by a barrier called the Wall of Severance. As far as teenaged protagonist Kureha is concerned, bears are evil outsiders, an ideology that only becomes stronger when a bear kills her girlfriend. This dichotomy becomes more complicated, however, when Kureha learns that she has a mysterious, forgotten connection to Ginko, a bear who crosses the Wall to find her. Furthermore, her human classmates are as much a threat to her as the predatory bears, having singled Kureha out as an “evil” girl who does not conform to their rules. Kureha is caught between two worlds, embroiled in a fantastical story about love and sexuality that doubles as an allegory for the cruelty of prejudice. There are many metaphors, both visual and narrative, woven throughout Yurikuma, but for this piece let’s examine three in particular and how they’re effective or ineffective: the girl bears, who serve as a fictional Other and form an allegory for discrimination against certain groups; Kureha’s school and its Exclusion Ceremonies, which embody the social ostracization of marginalized identities; and the Wall of Severance, the allegory for socially constructed prejudice and ignorance that the characters must overcome to be free in the end. While there is a valuable message at the heart of this series, it’s important to acknowledge that Yurikuma’s use of allegory is at times troublesome and tangled. With the fairy tale framing, the allusions to other works and genres, and the constant dives into abstract imagery, there are so many metaphors piled in Yurikuma’s proverbial arms that sometimes the series cannot see where it’s putting its feet, and this leads to problematic connotations. The biggest issue is the bears. In the story, human society has deemed bears “evil” and pushed them to the margins. The bears that the audience sees cross the Wall and hide in the human world are all women explicitly attracted to other women. Bear-girls thus form the series’ initial allegory for queer sexuality and desire, and it doesn’t take long for unfortunate implications to rear their head. Any magical, metaphorical message of tolerance begins to fall apart when the story’s fantastical Other is legitimately dangerous. An example from western media would be the X-Men series, in which hatred of Mutants was intended as an allegory for bigotry against marginalised groups. Initially this mostly centered on racism, but the series has also dabbled in allegory for homophobia, as seen with lines like “Have you tried not being a Mutant?” from the ’00s movies. Many critics have pointed out over the years that non-Mutants have very real and logical reasons to fear the Mutants and want them locked away, in that Mutants have incredible supernatural powers that, in some cases, could destroy the world as we know it. There is no such justification for, say, white society’s fear and segregation of people of color, or heteronormative society’s dislike of queer people, and so the metaphor fails and the message falls flat. Yurikuma faces a similar problem in having transforming bears be the marginalised Other to the “ordinary” society of humans. With human society as the audience’s initial, sympathetic window into this world, their fear and loathing of bears seems much less like bigotry and more like a perfectly justified survival method, since the bears go around literally killing and eating people. Queer folks, I’m sure I don’t have to tell you, do not. The use of a predatory animal as the metaphor for queer sexuality (as opposed to the seemingly chaste romance presented between the human girls, Kureha and Sumika) is also flinch-inducingly problematic. While we have sympathetic bears in the form of Ginko, her companion Lulu, and eventually Kureha herself, the series contains villainous lesbian-bears aplenty. This includes school principal Yuriika, who we learn was in love with Kureha’s mother before killing her in a fit of jealous rage and who now spends her time seducing students; and Mitsuko, the student council president who’s introduced as the series’ first antagonist and who later reappears as a decidedly sexual manifestation of Ginko’s animalistic desires. Both these villainous characters play into harmful tropes invoking the image of the deadly and seductive lesbian, as indeed do Ginko and Lulu when they’re first introduced and the audience is not yet sure whether to trust them. To contrast the stuffy and repressed culture of Kureha’s school, the bears represent unbridled natural urges. This includes openly pursuing their hunger, with “hunger” quickly becoming an obvious stand-in for sexual lust. When they first arrive, Ginko and Lulu follow Kureha around gnashing their teeth and waxing poetic about how delicious she smells. Later, when Ginko first gets Kureha alone in her house, she invades her personal space in a menacing manner that mingles the threat of sexual assault with the threat of being mauled. Eventually Ginko and Lulu become much more sympathetic characters, but this doesn’t detract from their initial contribution to the stereotype of queer desire as inherently predatory and dangerous. It continues to rear its head throughout the rest of the series, in some cases muddling the other allegorical devices as it crosses over with them. For example, Sumika, a queer girl excluded and left to the bears by her classmates, is threatened by both the Exclusion Ceremony (the story’s allegory for homophobia) and the bears (the story’s allegory for queer sexuality and desire). The true symbolism of the dangerous queer-girl-bears could be that they represent the stereotype of the predatory lesbian that the school’s culture is perpetuating and using to keep the students on the straight and narrow… which, while effective in theory, does not stop the bear characters themselves from falling into these stereotypes throughout the story. The school and its Exclusion Ceremony is the series’ much stronger metaphor for the marginalisation and oppression of queer people. The prim and proper academy that Kureha attends is drenched in imagery to encourage an association with the genre of Class S, both in the behavior of the characters and the inescapable visual motif of the lily (the flower the yuri genre is named after, and a symbol of love between women). This ladylike academy is also filled with visual allusions to horror movies, has a foreboding and constrained atmosphere, and feels especially threatening to Kureha. Victim-blaming runs rampant, with everyone assured that if they stay together—“conform to the mood of the herd”—they will be spared. Anyone who steps outside the boundaries of “proper” behaviour is doomed. It isn’t explicitly said that Sumika was not “invisible” because she was openly queer, but it doesn’t take much to read it that way. This ideology’s most succinct and unsettling form is the Exclusion Ceremonies, wherein the class gathers to single out one of their own as “evil” via a vote on their cell phones. Once they have unanimously selected an outsider, they conspire to make her life Hell. Kureha gets selected in every ritual that the audience sees. The status quo is only disrupted once, when Sumika refuses to vote her as “evil”… a move that marks her “evil” by association. This earns Sumika the ire of her classmates in much the same way that Kureha did when the others saw her as allying with the “evil” bear in the past. The exact reason for Kureha being designated outsider—and whether this has anything to do with that now-forgotten friendship with a bear—is never stated. Again, though, the framework of Class S genre trappings heavily support reading homophobia into the situation. The students singling out Kureha and Sumika as “evil” becomes painfully ironic when it’s gradually revealed that many of them are also in relationships with other girls (some even in blatantly sexual relationships with their principal, who is, in the greatest irony, one of the very bears she was supposedly guarding them from). It becomes clear that these relationships are only acceptable when kept behind closed doors and repressed when in view of the public eye. Any deviation from that model is “evil,” officially labeled as such in the Exclusion Ceremony. It’s a system that’s downright dystopian, but its haunting effectiveness comes from it being an exaggerated, fantastical manifestation of the way that stigma against queer women works in the real world and is cemented by the media. The Exclusion Ceremonies gain an even greater level of irony and insidiousness when they continue even after Kureha leaves. When Kureha vanishes at the end of the series, one would think the students’ quest against “evil” would be laid to rest, but instead they vote to single out another student and start all over again. In this way, the Exclusion Ceremonies are proven to not just be cruel but ultimately hollow and meaningless; an empty ritual that provides comfort (so long as you’re not the one being voted out) that will probably continue unabated. This is the way the world works, as an endless set of boundaries and stigmas, and it’s only through leaving the world that Kureha and Ginko are free to be themselves. Here we come to the metaphor of the Wall of Severance. The series begins with a story about how all humans are good and all bears are bad. A comet flew overhead some years ago, you see, that turned all bears into bloodthirsty monsters, and so humans had to defend themselves with war and the giant Wall. The audience is positioned to take this history as concrete world-building, but as the story progresses it becomes increasingly clear that this is simply one version of the truth, and all our initial beliefs about bears and morality are thrown into question. Questions arise when focus shifts away from the modern human world, and instead to the fairy tale-esque kingdom of the bears in flashbacks to Ginko and Lulu’s pasts. Both bears watch the comet pass by with merely a moment of quiet reflection and are not suddenly filled with a hunger for human flesh. This aspect of this strange world’s origin myth—and the main reason behind the stigma against bears—is thus suddenly disproved. Not only that, but the bears have their own mythology and religion that aligns them against humans in the same way humans are aligned vehemently against bears. Ginko joins the war against humans because she’s an orphan looking for purpose and star-struck by the concept of appealing to her goddess, not because of meteor-shower-induced mania. Kureha and Ginko—a human and a bear—become friends as children in spite of this cultural divide (they find each other through a secret passage in the Wall, appropriately called “The Door to Friendship”). It earns them both the ire of their respective communities. In a flashback, a group of schoolyard bullies corner Kureha and decide that, since they saw her playing with an “evil” bear, then she must be “evil” too. How do they know bears are evil? Their mothers said so. The slightest resistance to this “truth” earns Kureha the violent disdain of the children, who quickly multiply into an angry horde chanting that she must be excluded. This is paralleled with Ginko, whose fellow bears see her as a traitor for befriending a human. And how do they know that humans are “evil”? It’s just what they have always known. Both humans and bears see each other as equally abhorrent, and both support this with their own version of the “truth.” So what is the real truth, the real reason for the building of the Wall? The audience, and the characters, will never really know, and this is a deliberate move on the series’ part. It shows that prejudice and violence grows out of perceived truths, often those passed down through cultural myth or simply from one generation to the next. The Wall of Severance is a social construct—quite literally, something that was artificially built—that’s treated as a basic fact of life. It looms in the backdrop of the entire show as a representation of the prejudice and social pressures keeping Kureha and Ginko apart. In the end, Yurikuma Arashi is about Kureha and Ginko and their love story, one that’s impeded at every turn by the world around them. They must overcome physical threats like the Exclusion Ceremony as well as their own internalised stigmas, which their respective societies have planted and fostered. This all comes to a head at the series’ climax where (with the help of a goddess) Kureha turns into a bear. She and Ginko escape from the now-militarised force of the Exclusion Ceremony to a place “beyond Severance,” where they’re free to be together and be themselves. The fantastical aspects of the world come together to create an allegory for the treatment of queer people, and especially queer girls/women: how they are Othered, repressed, questioned, and forced to change fundamental things about themselves in order to be accepted. And it’s an allegory that has impact, because this world woven with metaphors for queer oppression actually has queer leading characters. When Kureha and Ginko declare their love for one another and share a big Hollywood kiss in the climactic scene, a student shouts “That’s revolting!” Is she disgusted because she’s seen two girls kiss, or because she’s seen a bear kiss a girl? Either and both could be true, as the allegory and the actual issue it’s mirroring converge to drive the point home. 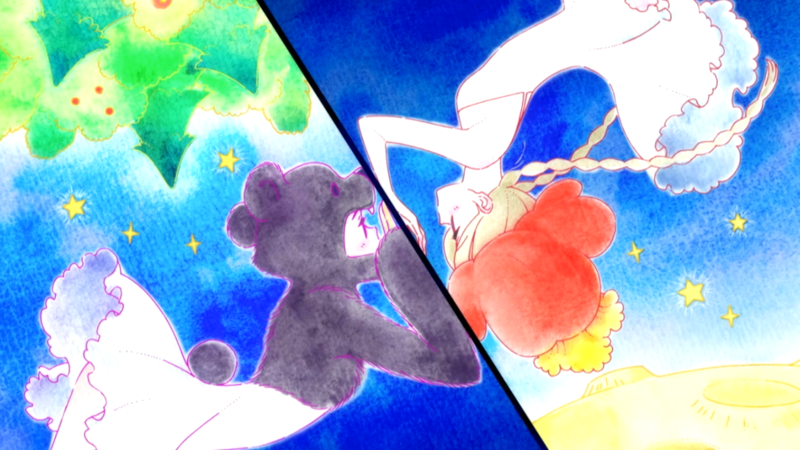 Yurikuma’s allegories are not always free from issues, and they trip over one another as more are introduced. But the message about prejudice and homophobia they express—especially in the case of the Exclusion Ceremony metaphor—packs a greater punch because its protagonists are directly linked to the issue at the heart of it. The series delivers its themes with far more impact than if Kureha had been a straight girl caught up in an abstract allegory about how oppression is nebulously bad. Having the protagonists of the series be queer not only grounds the metaphor but gives the characters actual stakes in it. Getting singled out in the Exclusion Ceremony isn’t this fantasy world’s equivalent of being queer, but is directly tied to the characters’ identities and their struggles against an oppressive system. Even with fantastical and allegorical exaggeration, it makes their personal conflict with the system all the more real, and all the more triumphant when they escape it. By the end of the series, the allegory and the actual issue the series is addressing come together. This culminates into a story not just of a girl and a bear declaring their love in a world where humans and bears don’t get along, but of two young women declaring their love in a world that spurns and suppresses queerness. Bears have been the metaphor for unrepressed queerness all along (clumsy predatory lesbian connotations and all) so Kureha transforming into a bear can be read as her embracing her sexuality. But the metaphor is not all that the audience has to affirm this because there’s legitimate queer representation in the story. Yurikuma Arashi is a flawed series, but at the heart of its sometimes dizzying typhoon of metaphors and surrealism is a sincere and impactful message about the hollow cruelty of ignorance and prejudice. The series uses its fantastical devices to deliver real social commentary, from the war and its broad messages about the power of ignorance and propaganda, to the school and its more focused criticism of the social pressure for girls to conform to strict roles. It creates a fantastical world to frame its examination of real-world issues and links back to those issues by representing the actual people dealing with those issues. And that’s what makes this series, for all its messiness, so valuable.